I bought my solar oven several years ago and I’m learning more & more how to use it. Living in NE Texas, the summers are hot, humid and sticky. I hate to fire up the oven in my kitchen. So it’s the solar oven to the rescue! I’m able to keep that cooking heat outside where it belongs! But today the temps outside are spiking and humidity is on the rise. It’s absolutely miserable outside! So I’ll be utilizing my solar oven to make my casserole. The recipe below shows regular oven instructions though, so read on! * Now let me say first of all that I purchased my solar oven myself. But Sun Oven offered a discount for my Sun Oven door upgrade in exchange for my honest review of it. If you decide to make a purchase through one of the links contained in this post I may receive a commission. But the price you pay will NOT be changed. It’s an easy way to support this blog without anything coming out of your pocket. So if you’re interested in buying them, don’t be shy! I’ve used my solar oven to Bake Bread several times, and I’ve also baked Pork Chops, Baked Potatoes and even made homemade Marinara Sauce and many more things. Casseroles are wonderful things to make in the solar oven too, and I’ve made a delightful SW Chicken & Herbed Brown Rice with ease. 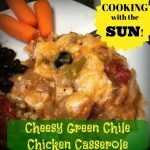 But today I’m making the Cheesy Green-Chile Chicken Casserole that RancherMan’s been jonesing for. First I needed cooked, cubed chicken. Since I baked bread in the solar oven today it’s already warmed up & ready to go! I used a package of fajita-seasoned chicken breasts, but you could use regular chicken breasts if that’s what ya have. If so, season it with a mixture of chili powder, cumin, cayenne, garlic powder and paprika to your tastes. I opened the package of chicken and placed it all into the crock. I layered each chicken breast out straight and tried to offset-stack them. Then I put the lid back on and set it in the solar oven. So my oven never really got as hot as it could have if it were properly aligned. 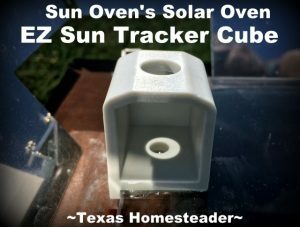 I bought a replacement door for my Sun Oven that includes the sun-tracker cube. (the skies open wide and choirs sing!) This little cube is my best solar-cooking friend! And it couldn’t be simpler to use. The sun shines through the first hole. You simply align that tiny beam of light onto the second hole and BOOM! There is one of these cubes on either side of the oven door to help you properly align your Sun Oven directly toward the sun. The result is a higher temperature achieved in the oven in a much shorter time. YEA! I love this thing! Aaaanyway, today’s the day to make my casserole. Although the forecast had promised mostly sunny, the day suddenly turned partly-cloudy shortly after I started cooking my chicken. As a result my oven temps didn’t get as high as I’d like. No problem, I just needed to cook the chicken a little longer. Instead of about an hour, it took about 1.5 hrs to get the chicken to reach 165 degrees Fahrenheit. Then I brought the chicken inside, allowed it to cool and diced up 3 of the cooked breasts. The remaining two chicken breasts were labeled and placed in the freezer for a future heat-n-eat meal. Cook-Once, Eat-Twice – that’s how I roll, baby! The three breasts made about 3 cups of cubed chicken. Now that the chicken’s ready I turned my attention to the filling. First I chopped a large onion. Then into my skillet I added just enough bacon grease to saute the onion. When the onion was translucent I added a minced clove of garlic. Then I started piling in the other ingredients: about 1/2 cup of my homemade Salsa Verde, an un-drained can of diced tomatoes, a can of Cream of Chicken soup (which you can TOTALLY make yourself, or a purchased can is fine too). Finally I drained 7-oz can of diced green chiles and dumped it in too. I got the mixture hot and then stirred in my 3 cups of diced chicken. I topped the tortillas with 2 cups of my meat mixture and about 1/2-cup of shredded Mexican-blend cheese. These layers were repeated twice more and I dumped the remaining cheese on top. Just because I like the way it looks, I added some sliced black olives. Then back into the solar oven it went! The sun was lower in the sky but using the focusing cube I was able to quickly bring the oven temps up to 350 degrees. About 30 minutes in the oven was enough to get everything all melty delicious. If you’re ready for your own solar oven you can get discounts offered to our readers here –> Texas Homesteader Reader’s Discount They are offering a coupon code worth $50 off your own Sun Oven, or a whopping $70 off the Sun Oven with the Preparedness Dehydration package. 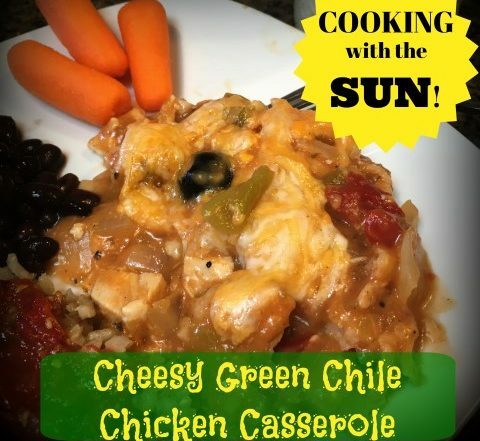 But even if you don’t have a Sun Oven you can make this recipe in your own electric or gas oven as well. You can use leftover cooked & cubed chicken breast. Or cook chicken breasts seasoned to taste with chili powder, cumin, cayenne and paprika in covered dish in Sun Oven (or regular oven) until temperature probe placed in thickest part of chicken reads 165 degrees F. My solar oven took about 1.5 hrs on a partly-cloudy day. Cool and cut 3 medium chicken breasts into cubes (or about 3 cups, cubed) and set aside. Make casserole filling by sauteing onion and garlic in a small amount of oil until translucent. Then add 1 un-drained can diced tomatoes, 1 can green enchilada sauce, 1 can Cream-of-Chicken soup and 1 can drained chopped green chiles. When heated through add cubed chicken and stir gently - heat until warmed through. In a casserole dish spread just enough sauce to coat bottom of dish. Then layer 3 corn tortillas on top of sauce. Ladle 2 cups meat mixture on top of tortillas and spread to edges of dish. Sprinkle 1/2 cup cheese over all. Repeat these layers twice more and top with remaining cheese. Add sliced olives to top if desired. Place lid on pot and place in pre-heated solar oven. Try to maintain about 350 degrees for about 30 minutes, or until cheese is melted. This entry was posted in Blog Posts and tagged Cooking, Environment, Solar Cooking, Summer on July 30, 2017 by Texas Homesteader.